Pope Boniface VIII (c. 1235 – October 11, 1303), born Benedetto Caetani, was Pope of the Roman Catholic Church from 1294 to 1303. Related to several earlier popes, he appears to have been more interested in furthering the position of his family than that of the Church, except that consolidating papal authority was a means to an end. The Pope, he said, was the Church, therefore selling appointment was not simony. He is described as the last of the great papal emperors, whose temporal power was as significant as his religious authority was. He succeeded a pious and good man, Pope Celestine but one who could not manage the papal machinery and who was actually too generous with his gifts for the treasury to cope with. Celestine abdicated and Boniface VIII (Benedict Gaetani) was elected to succeed him. On a positive note, he placed the papacy at the center of every dispute in Europe, re-enforcing its moral authority. On a negative note, his preference for his own family did much to transform the papacy into a family business, a process that continued under the Renaissance Popes and which directly contributed to the origin of the Protestant Reformation that rebelled against the wealth and spiritual indifference of the Church. Celstine, though, had been a spiritual man; Benedict realized that to survive as Pope the power he had to exercise 'was the same type as that exercised by any other monarch' (Chamberlain: 95). Benedict extended the Papal States over which the Pope ruled directly, capturing Florence. Among those who were thrown into prison was Dante, who hated Benedict with a passion. Chamberlain speculated whether Benedict 'was a direct or indirect cause of the tumult that retarded the birth of democracy in Florence' but Dante subsequently 'developed his theme that... the temporal power of the papacy was an offense to heaven which condemned all mankind to chaos' (1969: 110). Boniface VIII was born in Anagni as Benedetto Caetani. Before his election as Boniface VIII, Benedict had served as a cardinal priest and papal legate to Sicily, France, and England. A previous pope was his mother's uncle, and several other Pope's were also related. By the time he became Pope, he had worked within the Curia in Rome for forty years and was a skilled tactician. He had already acquired benefits and property in England, France and Italy and he continued to add to these. He was elected in 1294 after Pope Celestine V (Peter of Morone) abdicated. Celestine's election had surprised and delighted most Christians because of his reputation for integrity and piety. When elected, he was living as a hermit in a cave on a desolate mountain. In order to inform him that he had been elected Pope, the College of Cardinals had to travel to Peter, a thousand feet up the mountain. Celestine had been elected as a compromise due to rivalry between two families represented by Cardinals, the Colonna and the Orsine. The previous Pope belonged to the latter family, so the former family considered that they now had the better claim on the Papacy. Meanwhile, Peter of Morone's reputation for seeing visions and performing miracles had grown. In Outremer (Palestine), the 'Saracens had retaken Acre and Tripoli' while England and France were 'plunged in a war that threatened the unity of Christendom' (Chamberlain: 78) and Peter, dedicated as he was to 'the Holy Ghost' seemed just what the Church needed. Celestine tried to rule through a board of regents, three cardinals appointed by himself but this arrangement proved unpopular. Ironically, Celestine was too spiritual but not sufficiently wise to the ways of politics to be a success as Pope. Resignation appears to have been his own decision. Benedict was elected ten days later. One of his first acts as pontiff was to imprison his predecessor in a small cell the Castle of Fumone in Ferentino, where he died at the age of 81, attended by two monks of his order. Although Celestine had abdicated, he still had supporters and Boniface saw him as a threat. In 1300, Boniface VIII formalized the jubilees, which afterwards became a source of both profit and scandal to the church. Boniface VIII founded the University of Rome La Sapienza in 1303. He intervened in every dispute in Europe, often giving good advice and can even be said to have exercised 'skill and justice' (Chamberlain: 94). However, his appetite for temporal power grew so strong that he neglected spiritual concerns. Boniface VIII put forward some of the strongest claims to temporal, as well as spiritual, supremacy of any Pope and constantly involved himself with foreign affairs. Even before his election, when he was legate in France, he chastised the University Faculty for daring to intervene in politics, saying, 'You Paris masters at your desk seem to think that the world should be ruled by your reasonings; I tell you this is not so, it is to us that the world is entrusted, not to you' (Chamberlain: 87-8). In his Bull of 1302, Unam Sanctam, Boniface VIII proclaimed that it "is necessary for salvation that every living creature be under submission to the Roman pontiff," pushing papal supremacy to its historical extreme. The Pope, said the Bull, wields two swords, one spiritual, one secular and does so in God's name. The secular power is exercised by the civil authorities but under the guidance of the Church. Anyone who does not recognize the authority of both swords stands eternally damned. These views and his intervention in 'temporal' affairs led to many bitter quarrels with the Emperor Albert I of Hapsburg, the powerful family of the Colonnas and with Philip IV of France (1285–1314). Chamberlain (1969) points out that in surrounding himself with members of his own family, Bonifacecould claim that he was 'protecting the interests of the church' because these men were tied to him by a double loyalty, by blood and by gratitude (95). Boniface had a genuine love of his family which, says Chamberlain ' was one of his most attractive virtues' but unlike a temporal monarch he could not transmit his power to his heirs. He spent as much as two-years worth of the Papacy's revenue on purchasing land for his family, so that 'a clear-cut chain of Gaetani cities could be seen over the hills from Rome southward to Caserta and the distant sea' (95). Boniface loved ceremony and public appearances at which people would throw themselves on the ground in front of him and kiss his feet (103). he was a tall, imposing figure, 'over six feet tall' and 'massive', capable of wearing the 'towering Oriental tiara' that represented authority on earth, in heaven and over purgatory (107). As far as Boniface was concerned, he, not Albert was 'Emperor' and wore the imperial purple 'together with the gilt shoes and spurs, with the great sword in his hand and the cross on his breast' least there be any doubt about this (115). He developed a hatred for certain people, especially for the leader of the pro-Celestine party, Jacopone da Tardi (1236-1306), who was also an ally of the Colonna. Jacopone was 'convinced that Boniface stood for all that was worldly in the church, for all that was ultimately corrupting' (97). Towards the end of his own life, Boniface imprisoned Jacopone who was released when the Pope himself died. Bendict commissioned many portraits and statues of himself. Boniface's preference for his own family, while obviously nepotism, was no better or worse than that of the Colannas and Osini, to both of whom he was also distantly related (80). Chamberlain also points out that this loyalty to family was typically Italian. Lacking noble blood, an ambitious man such as Boniface could not aspire to an ordinary crown; the 'Papacy was the only goal in Italy' for someone like Boniface. (94) He took literally words from his Papal coronation, 'Know that thou art the father of princes and kings - the ruler of the world' (122). He siphoned off so much money to finance his own family that he even 'exceeded the cynical tolerance of the times' (94). In 1297 he declared a Crusade against the Colonna, enabling him to enlist the aid of the Military Orders created earlier to assist in the defense of the Holy Land but also to do the church's bidding. By late summer of 1298, most of the cities controlled by the Colonna had fallen to the crusaders. Boniface became notorious for totally destroying the Colonna stronghold of Palestrina, breaking his own word in doing so. Acting just like a Roman Emperor, he ordered that the city be dismantled and the land ploughed with salt, in imitation of the Roman victory over Carthage. His quarrel with Philip IV of France became so resentful that he excommunicated him in 1303. Philip needed money in order to control unruly France. He could not raise the money from his nobles, because they were exempt from tax, so he turned to the Church and started to 'milk the enormous wealthy Cistercian order' (Chamberlain: 117). The Cistercians were under the protection of the Pope and he responded with a Bull prohibiting kings from extracting money from the Church without papal permission. Philip responded with a law forbidding both the export of money and foreigners from living in France. This directly impacted on Church revenue leaving France for Rome. Before the Pope could lay France under an interdict, Boniface VIII was seized at Anagni by a party of horsemen under Guillaume de Nogaret, an agent of Philip IV and Sciarra Colonna. The King and the Colonnas demanded his resignation, to which Boniface VIII responded that he would 'sooner die'. The Pope was released from captivity after three days but died a month later, on October 11, 1303. 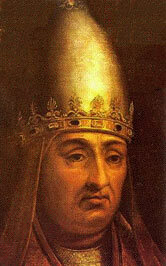 No subsequent Popes were to repeat Boniface VIII's claims of political supremacy. Boniface VIII was buried in St. Peter's Basilica in a grandiose tomb that he had designed himself. Allegedly, when the tomb cracked open three centuries after his death (on October 9, 1605), his body was revealed to be perfectly incorrupt. 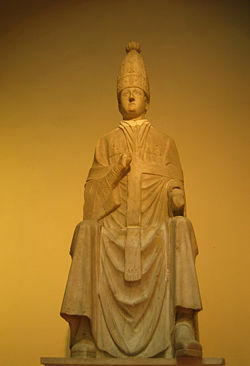 Statue of Pope Boniface VIII at The Museum of the Opera del Duomo in Florence. In his Inferno, Dante portrayed Boniface VIII, though alive at the date of his vision, as destined for Hell—specifically the Eighth Circle, in a special pit reserved for Popes guilty of simony. Dante claims to know this because Pope Nicholas III, whom he meets as the current occupant of the pit, tells Dante that he foresees the damnation of his successor. Later in the Inferno, we are reminded of the pontiff's feud with the Colonnesi, which led him to demolish the city of Palestrina, killing 6,000 citizens and destroying both the home of Julius Caesar and a shrine to the Blessed Virgin Mary. Boniface's ultimate fate is confirmed by Beatrice when Dante visits Heaven. In Boccaccio's Decameron, Boniface VIII is satirically depicted granting a highwayman a priorate (Day 10, second tale). Earlier (I.i), Boniface VIII is also mentioned for his role in sending Charles of Valois to Florence in 1300 to end the feud between the Black and White Guelphs. Any religion and especially Christianity does not only contain some truth, but also many errors. The long list of Christian untruth includes trinity, the virgin birth, the godly nature of Jesus, the eucharistic transformation of bread and wine into the body of Christ and the resurrection of the dead. The historicity of these quotations is disputed among scholars. Thomas Boase, whose biography of Pope Boniface VIII is often regarded as still the best (see literature), comes to the conclusion, "The evidence is not unconvincing ... but it was too late, long years after the event, to construct an openly held heresy out of a few chance remarks with some newly-added venom in construing them" (p. 361). The posthumous trial against the memory of Boniface VIII was in any case settled without a result in 1311. This page was last modified on 15 June 2016, at 19:40.